xoComm: A highly flexible and configurable HTTP/1.0 and HTTP/1.1 server and client access implementation. It supports client access to several other common web protocols. xoXML XOTcl environment for parsing XML-files into an abstract syntax tree and vice versa. xoRDF: An XML/RDF parser/interpreter environment for XOTcl xoRDF Online Demo. xoStore: A general persistent store for XOTcl objects. xoStore is a wrapper for several database implementations. The version in the XOTcl distribution is based on GDBM. xoMOS: An mobile object system based on HTTP and RDF. xoAWO: An active web object system that allows you to easily build web applications with active web documents and web facades to agents. Note, that the ActiWeb components come as a preview release, which demonstrate XOTcl on some larger examples. ActiWeb does not include a full documentation yet (look into the examples in the distribution). Biok is a prototype of a programmable application for biologists written in XOTcl by Catherine Letondal from the Pasteur Institute in Paris. Its purpose is twofold: to analyze biological data such as DNA, protein sequences or multiple alignments, and to support tailorability and extensions by the end user through an integrated programming environment. Within the Biok project, Alexis R. Gambis wrote an interesting experience report about the use of per-object mixins for increasing the tailorability the object system for individual users. See the report A. R. Gambis, Interaction between the User and Heijne's membrane topology prediction algorithm Toppred for details. XOTclIDE is an Integrated Development Environment for XOTcl modeled after the Smalltalk programming environment. XOTclIDE is implemented by Artur Trzewik. ENIÄK is a high-level protocol and object system for controlling and building user interfaces that work with a large variety of display platforms (including Tk, Windows, WWW, Gtk, text terminals etc. ), without change to the application and without recompilation. The system is developed in XOTcl by Kristoffer Lawson, Antti Salonen and Matti Koskimies. xoRBAC provides a Role-Based Access Control (RBAC) service that conforms to level 4a of the NIST model for RBAC. It supports high-level modeling of roles, permissions and constraints, and provides RDF import/export for the access control data. The Web Server of www.xotcl.org is implemented in XOTcl. Xdobry: Xdobry is Form Editor for relational databases. It support the interactive creation and modification of database schemata, Drag and Drop interface, GUI editor, etc. The basic ideas is do provide a kind of MS Access for Linux. Xdobry is implemented by Artur Trzewik. Down below you can see some screen-shots of applications using XOTcl/Wafe. 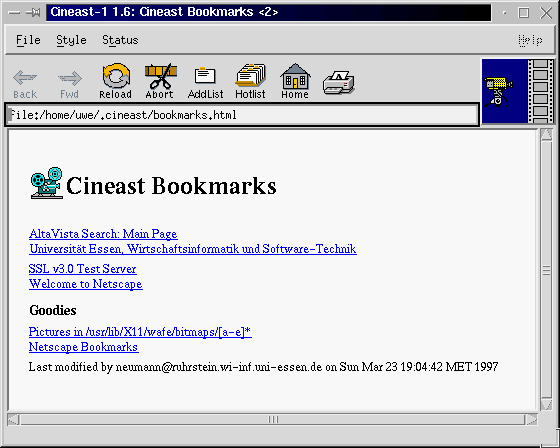 The first picture shows the web-browser Cineast. The next picture is taken from an web application for managing and reviewing the OOSS conference. 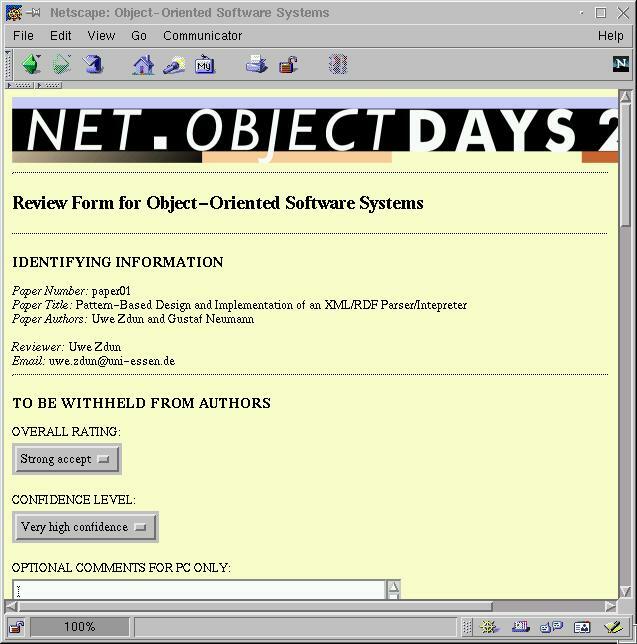 It is build with ActiWeb and included in the examples of the full distribution. 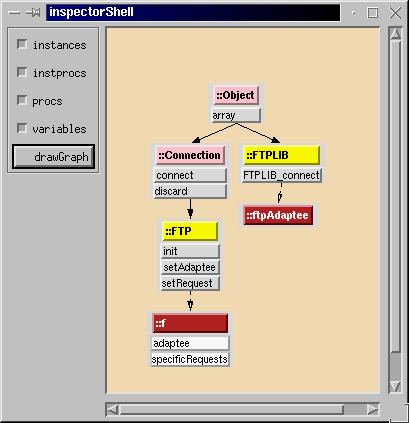 The next picture is taken from an Inspector application which shows the current class-graph, instances and methods/variables. Here, an adapter design pattern using filters to adapt ftp requests is shown.